The main thing I knew about sisal is that the smell always gave me a massive headache. I used to manage a store that carried a lot of sisal baskets and rugs and had to arrange to have those placed far off in the corner. The sisal fibre is traditionally used for rope and twine but also has many other uses, including paper, cloth, furniture and, even dartboards. Sisal fibre comes from the agave plant and grows in a variety of hot and dry climates that are unsuitable for other crops - like Turks and Caicos, where fruit and vegetable crops had failed. From the first production companies in 1890 until around 1919, sisal export was a booming business in the islands. After harvest, its leaves are cut and crushed in order to separate the pulp from the fibres. It is a coarse, hard fibre not suitable for textiles or fabrics, but it is strong, durable and stretchable. It also does not absorb moisture easily, resists saltwater deterioration and the texture accepts a wide range of dyes. Polypropylene, a thermoplastic resin, is reducing demand for sisal rope which could have been disastrous for the industry, but new uses have been found and now sisal can be found in specialty papers, filters, wall coverings, carpets, mattresses, and as a reinforcement in plastic composite materials for furniture and automotive parts. It's also being used as a substitute for asbestos in brake pads. And then there are those dartboards where it's been found to be the best material. Quality dartboards are made of sisal fibres; less expensive boards are sometimes made of cork or coiled paper. Even the by-products from the sisal extraction are used for making biogas and pharmaceuticals as well as for fertilizer and animal feed. Thanks. 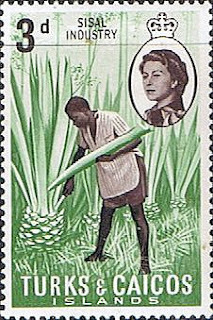 I had no idea that Turks and Caicos was into sisal - and salt apparently, there's also a stamp for that in this set. I would have never made the thermoplastic connection with sisal. Neither would I , but it makes sense. Though it was manila hemp from the Philippines that first put a dent in sisal. Interesting information, and interesting stamp! When thinking of this Sunday's theme I hadn't thought about plants so far, but indeed the plant, sisal in this case, forms a main 'ingredient' for many industrial purposes! And the main (I think) resource, oil, of course also has plants as a basis. Interesting to know that dartboards should be made out of sisal, too! I was quite shocked by the dartboards reference, too! It was the 'industry' written on the stamp that first caught my eye and put me in this direction. It's a nice stamp. I didn't connect it with the theme until I read your explanation. Never knew how it grew, like a giant pineapple (but not as tasty). I shall look at dartboards in a new light now. I never knew what it looked like as a plant, either. Definitely wouldn't want to try tasting it! Quite interesting - I like learning new things. I like to know about things that are unusual too - like how this is the crop that can grow in areas where others have failed - and the newer uses for a product. I do remember as a kid that whenever a rope was made of sisal that it was very tough and the fibers would sometimes cut into our hands if we ran them the wrong way on the rope. Good strong rope for fishing boats in Alaska. I am surprised at how many uses for some plants can be found. I always associated it with ropes on ships - until all those sisal baskets became popular!